[..YouTube..] I gotta head out for the evening, I’ll upload the transcriptions when I get home! Sorry if you wanna get on em right this second and can’t, it’ll be up asap, promise! [..YouTube..] Finally one of your lessons I understand. Also please do a cymbal tour vid some time, cheers! [..YouTube..] @amazonhippie Awesome! 😀 Glad ya dig! [..YouTube..] PDF transcription is up, it’s the first link under the video. 🙂 Sorry for the delay! [..YouTube..] kinda like a somekinda 5/4 sound of muzak, nice! kinda like a somekinda 5/4 sound of muzak, nice! 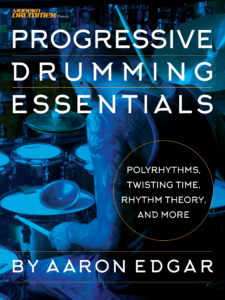 [..YouTube..] @aaronedgardrum totally not relevant, but what the heck is the stack you use? It sounds fantastic. [..YouTube..] totally not relevant, but what the heck is the stack you use? It sounds fantastic. totally not relevant, but what the heck is the stack you use? It sounds fantastic. [..YouTube..] you been working out? [..YouTube..] Dude, this video is so duper. Thanks for all your hard work and making things a little more clear. Cheers! Dude, this video is so duper. Thanks for all your hard work and making things a little more clear. Cheers! [..YouTube..] @unknownheroAK My pleasure! 🙂 Glad you dig it! [..YouTube..] My pleasure! 🙂 Glad you dig it! My pleasure! 🙂 Glad you dig it! [..YouTube..] @aaronedgardrum I want to lose some,but not to the same extent as you,how’d you do it? [..YouTube..] I want to lose some,but not to the same extent as you,how’d you do it? I want to lose some,but not to the same extent as you,how’d you do it? [..YouTube..] @aaronedgardrum Another fantastic option if you don’t want to go that over the top is P90X it’s also extreme, but easier to modify and gets great results! [..YouTube..] Another fantastic option if you don’t want to go that over the top is P90X it’s also extreme, but easier to modify and gets great results! Another fantastic option if you don’t want to go that over the top is P90X it’s also extreme, but easier to modify and gets great results! [..YouTube..] Thanks a lot, your videos really help me out. After nummerous replays of 1:17 – 1:30 I finally wrote it on a sheet and know I got a fine little beat going on my set! Thanks a lot, your videos really help me out. After nummerous replays of 1:17 – 1:30 I finally wrote it on a sheet and know I got a fine little beat going on my set! [..YouTube..] Dude. LOVE your videos. For real man, you’re a huge influence. Dude. LOVE your videos. For real man, you’re a huge influence. cool video – sounds like 5/4 (as in FIVE FOUR time signature) to me… Polyrhythmic 5/4? still a cool video either way though, good job… cool snare drum! Damn that is a nice snare! How deep is that monster?